There is so much pizza on this Earth and we have so little time. Eat as many as you can, while you can. When you’re an Italian restaurant with some of the best charcuterie in L.A., you better be slapping that cured meat goodness on some pizza. And Bestia does. For those of you who don’t know the gospel of ‘nduja, it’s a spicy, spreadable salume from Calabria, and it’s basically the pimento cheese of meat. The crust is charred and doughy and perfect for standing up to all that tasty meat paste. Their pizzas are cooked at almost a thousand degrees and can be in the oven for less than a minute. The crust has a fermented sourdough twang that synergizes with the leopard-spotted char to create an intensity that wavers from funky to acrid but always ends back on funky. The guanciale—pork jowl bacon that tastes exponentially more like bacon than bacon does—is sliced thin and crisps in the heat. The ricotta adds that creamy sweetness to offset the salty pork, and then fresh scallion and fennel pollen dusted on top add the fresh and floral. The highest-end of the DIY, single-serving pizza places makes a superthin Neapolitan-style crust that—I admit—does have a tendency to get soggy in the middle. But that’s only if you’re a scrub who doesn’t know how to order. Load up the pizza with a bunch of useless vegetables and of course they’re going to bleed moisture—that’s just science. The zucca has no sauce, leaving the crust nice and chewy, and the bacon, roasted butternut squash, caramelized onion, and rosemary oil is the best combo of sweet and savory. Get it by the slice. I can’t explain why, but it just tastes better than way. It has spinach, garlic, peppers, kalamatas, mushrooms, and tomatoes on a thin-but-incredibly-sturdy New York style crust that stands up the all that veg weight. And if you think Pizzanista’s music is too loud, you’re too old. When a restaurant is named after a key ingredient in deep dish pizza, you should probably eat their deep dish pizza. Owner Rob Rowe was born and raised in Chicago and knows his way around monstrous pies loaded up with tons of pepperoni and sausage. Cheese under the sauce, tons of garlic, unadulterated tomatoes, and a buttery crust so high it looks like stadium walls—Masa holds it down. It’s deep, it’s buttery, it’s chewy if a little bit flaky, and it has an entire layer of ground sausage spread across the whole surface of the pizza, giving you the maximum amount of seasoned, processed meat per bite of sauce and cheese. Hollywood Pies is scratching the deep-dish itch in L.A. in a big way. Prime might be L.A.’s best by-the-slice pizza place right now, and even though all their traditional red sauce pies are fantastic, from veggie to classic pepperoni, you should get the BBQ chicken. Here’s why: How often do you get a chance to eat a classic California fusion pizza from a place that truly cares about their dough and ingredients? Not that often, is the correct answer. So you should do it. All that spicy, smoky, sugary deliciousness in one easy-to-consume slice. I maintain that Gjelina’s pizza is at its best when ordered by the slice from GTA. You get a higher topping-to-crust ratio, and that’s especially important when the restaurant is using premium ingredients like lamb sausage, rapini, and confit tomatoes. Pay respect to your fusion pizza OGs. CPK might be known as the originator of the BBQ chicken pizza, but you have to go down the list to find their best chicken-plus-sugar-sauce combo. You get that fragrant allspice-y flavor from the chicken and the red and yellow bell peppers marry with that sweet “Caribbean sauce,” whatever that means. The dough might not be long fermented and blistered, but this is a damn tasty pie that will remind you how much fun pizza was when you were a kid. No one should be judged for eating pizza for breakfast, whether that means eating a few cold leftover slices from Domino’s the night before, or Faith and Flower’s Eggs Benedict pizza. It has smoky bacon and spinach topped with cheese and Hollandaise and finished with an egg cracked right in the middle. This is thin, chewy, sold-by-the-massive-slice New York-style pizza at its best. This is also white pie at its best. Salty mozzarella blanketing the whole pizza with the sporadic dollop of ricotta to up that creaminess factor. This is a total homer pick, but, screw it, we’re doing it. Enzo’s in Westwood is too cheesy, too greasy, too floppy, and that’s what makes it so perfect. It’s the epitome of the late-night, craving-worthy pie where the mozzarella is going to slide off the point of the slice when you pick it up but it’s cool because it gives you snacking cheese for later. Also, Enzo’s over Lamonica’s all day, don’t @ me. Not all pizza needs cheese. Like 99.9 percent of them, sure, but this pie from Milo and Olive falls in that .1 range. Intensely salty olives and intensely salty anchovies get brightened up by fresh tomatoes and subdued by a liberal dousing of olive oil. It’s all marine funk and salinity set against the chewy, pillowy brown crust that only a bakery could pull off. With Nancy Silverton, Mario Batali, and Joe Bastianich behind it, Mozza is like the Golden State Warriors of pizza. The crust around the outside is puffy and has a shattering crunch that gives way to the pure, fermented pillowiness inside. Put some delicate squash blossoms and burrata on there and you have what’s become a signature pie from one of L.A.’s signature pizzerias. In the battle to become the Chipotle-of-pizza, Blaze has taken an insurmountable lead (sorry, MOD, Pieology, Pizza Rev). And for good reason: It’s consistent, you get unlimited toppings for under $9, they have a surprising amount of premium ingredients, and it takes less than five minutes to get your food from the time you start ordering. The Red Vine pizza has ovalini mozzarella (fresh mozz as opposed to the salty shredded stuff), parm, basil, cherry tomatoes, and a drizzle of olive oil. Also it was started by the dude who invented Wetzel’s Pretzels and I think that’s rad. Anything from Lodge Bread Co.
Every Sunday between 5 and 8 p.m., the mad genius baking scientists behind the gnarly loaves at Lodge Bread put on their pizza hats and go to town. They make one pie per week using a ton of fresh produce and they range from radicchio and Bellwether ricotta to roasted sweet potato and chimichurri. It’s a whole wheat dough that gets some fantastic char in the oven and it’s so sturdy and chewy that it holds up to any amount of vegetables and sauces and cheeses that they throw on top. They play some pretty sick tunes during pizza night too. You should check it out. You know, before you die and all. You’ve heard of New York pizza, and Neapolitan pizza, and Sicilian pizza—but what do you know about Swedish pizza? At Viking pizza in Atwater Village, owner and Swedish native Vartan Nazari loads up a thin crust that reminds you of the best frozen pizza you’ve ever had with kabob meat, pepperoni, cheese, and onion, and then tops it with a spiral of creamy herb dressing that might be ranch but also might not be ranch. Casa Bianca is as old-school as it gets. The place opened in Eagle Rock in 1955 and every overly cheesy slice you eat there is like eating a moment of West Coast pizza history. The Deluxe with sausage, mushroom, and green pepper embodies that ultimate pizza joint flavor. If Casa Bianca is about as old-school as it gets, Barone’s is literally as old-school as it gets. It ‘s been serving thin-crust, rectangular Neapolitan pies since 1945. But the thing that really separates their pizza from the rest of the pack is the extra layer of cheese that goes on top of the toppings. It is a chopped salad on top of a sauceless cheese pizza. That sentence sounds way worse than the pizza actually tastes, I swear. The vinaigrette seeps out of the salad and the crust becomes a sponge for fat, salt, and acid, and it is glorious. 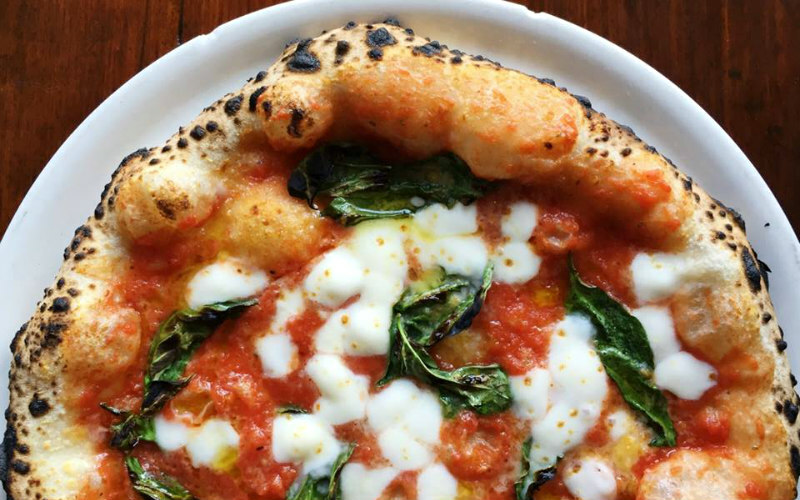 The original DeSano opened in Nashville, but the inspiration was always Naples. They’re thin crust pizzas that come in personal and giant sizes and are baked off in one of four ovens they have in the store. Get the Napoletana, loaded up with the savory, spicy, and bitter combination of sausage and broccoli rabe.